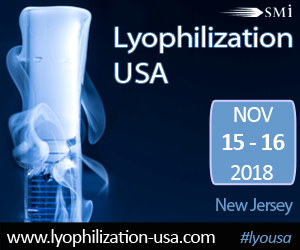 Building on knowledge and experience of the market, SMi Group is pleased to announce the release of the official agenda for the 4th annual Lyophilization USA Conference, which is due to take place in Iselin, New Jersey on November 15 – 16, 2018. Lyophilization is one of the most time-consuming and expensive operations, and improved drying technologies are required for current and future products. 16% of the top 100 pharmaceutical drugs and 35% of biologic drugs are lyophilized, and with more than 30% of the FDA-approved parenterals lyophilized and soon more than half of injectable drugs to require lyophilization, there’s a need for standardization and expansion of the lyophilization process in pharmaceuticals. This years’ Lyophilization USA conference programme will help participants to discover novel techniques and advances within lyophilization; gain insight into the regulatory challenges in lyophilization and how to overcome these challenges; discuss the current unmet needs within lyophilization and action points needed to address these needs; explore the most recent analytical and other technologies in lyophilization; hear from experts on alternative freeze-drying methods beyond vial lyophilization making Lyophilization USA Conference the perfect platform to strengthen knowledge in key principles.